History - In the 5th century, Kaling Kingdom was founded in Central Java, it was influenced by Hindu culture. So in Central Java there was also a residential area of Indians who then mixed with native Indonesians. Their culture influenced the native people in the region. The kingdom kept developing and in the 7th century it had become famous for the fertility of the land and the crops. Many Chinese merchants mentioned that in the 7th century there was a kingdom called Ho-ling (Kaling) in She-po (Java) whose people lived in security and prosperity. 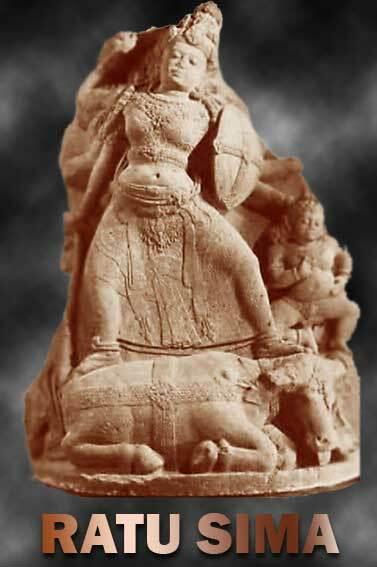 In 674, Kaling was ruled by a queen named Sima. She ruled very strictly but honestly. No people dared to commit a crime because the punishement was very severe. This was implemented to keep the people's life secure. No one had the courage to break the rights and responsibilities of others. One the queen tested the people's honesty by leaving a sack of gold in the middle of a road. No one dared to take the sack of gold, so it remained there for 3 years. Then the crown prince kicked the sack away to the side of the road. When the queen knew this, she punished the crown prince. It was also written in some Chinese documents that in Ho-ling there were a considerable number of Keling people from India who lived there. They did not eat with a spoon or chopsticks, they ate with their hands only. They were already able to write well. It was assumed that Kaling was located on the valley of Mount Merbabu, since the valley was exactly located at a village called Tukmas where a stone with inscription on it was found. The writing on the stone used Pallava scripts and Sanskrit language. The inscription was assumed to be made in 650 AD. It contained information about a spring with clear water in the area. The water from the spring flowed down, forming a stream with holy water like the Ganges. On the stone, there were also carvings of a trident, jug, lotuses, etc. The carvings were symbols in Hinduism. However, Buddhism also developed in Kaling. A Buddhist priest from China named Hui-hing once went to Ho-ling to visit a Buddhist priest named Inanabhadra in the country. The name was Indian, but actually the person was Javanese. With he help of Inanabhadra, Hui-hing was able to translate the holy book a Buddhism into Chinese. Obviously, Kaling was also a center of Buddhism teaching. Thank you for visited Website history, you may be useful for history lovers.